The contemporary public art institution is a storehouse of knowledge and artwork of the present day and recent past, an immeasurable aggregate of the multiple experiences and stories of artists and their works, respective audiences, as well as all people involved. Differentiated from a ‘collection’ by virtue of being the documentation of an exhibition, performance or event rather than the artwork itself, a gallery archive is a record of past proceedings and consists of related materials such as names, dates, photos, pictures, descriptions, essays, didactic materials, posters, displays, and invitations. As a rational system, mainstream notions of a successful archive privilege logic and accessibility over the flow of personal memory, emotion and imagination. Skeptical of a static and objectifying point of view, One Brief Moment invites artists to review apexart’s archive to interpret, speculate, add to and imagine their own understanding of what these materials represent. New works will be produced specifically for this exhibition and will include video, sculptural and conceptually-based projects. Rather than proposing a circumscribed and singular definition of an archive, the exhibition turns this infrastructure over to artists and creates ways in which they have agency over its shape and conception. Exploring alternatives to the stories traditionally contained within, these artists introduce subjective, incomplete or even discontinuous perspectives, considered from both the past and the future. By privileging an expanded field of narratives, One Brief Moment reexamines the Institution’s traditionally asymmetrical relationship to authority and knowledge, opening up the consideration that readings based on conjecture or ephemeral experience form as important an aspect of an institutions' history as the sobering distance of the relationships already formalized within its archive. 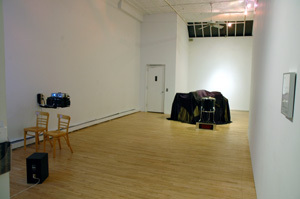 apexart's exhibitions and public programs are supported in part by The Peter Norton Family Foundation, The Foundation for Contemporary Art and with public funds from the New York Department of Cultural Affairs, and the New York State Council on the Arts. This exhibition received support from The British Council and IFA: Institut fuer Auslandsbeziehungen e.V.